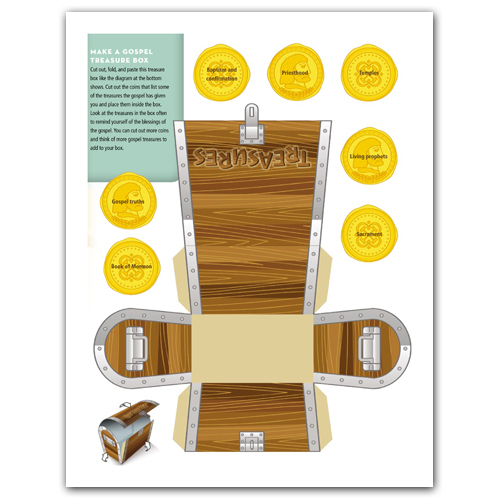 What You'll Need: set of scriptures, printed handout from the lesson, GAK 211/GAB 38: Christ Ordaining the Apostles, GAK 403: The First Vision, scissors, glue stick, and pen/pencil. LESSON PREP - Start by printing this handout onto card stock and cutting it in half to create 2 mini posters. Set one poster aside until the end of the lesson. 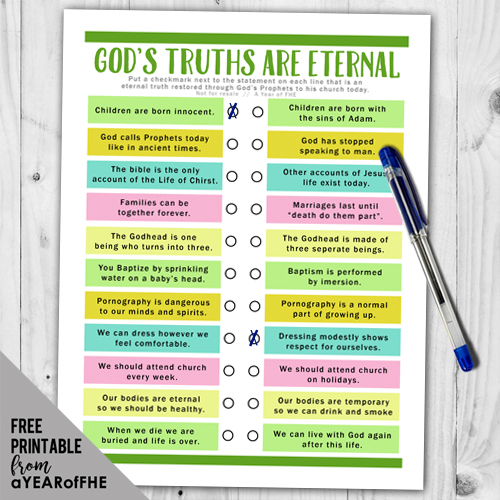 Assign each family member one or two of the scriptures listed on the handout. When Jesus was on the earth, He organized and built his church. There were certain parts of His church that he set into place. 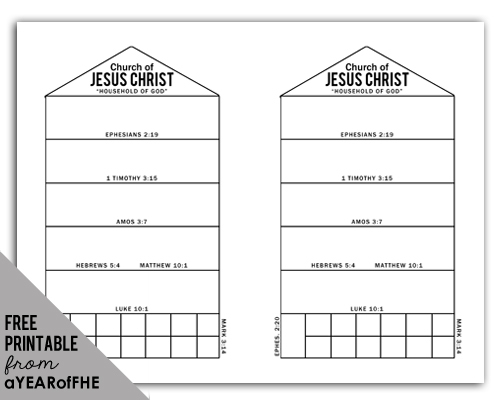 Today we are going to use the scriptures to build the same church He built when he was on the earth. Scripture #1 - Ephesians 2:19 // "Now therefore ye are no more strangers and foreigners, but fellowcitizens with the saints, and of the household of God. This scripture tells us that Jesus Christ wanted us to not be strangers in his church, but to gather together as saints (or members of His church). Scripture #2 - Ephesians 2:20 // "And are built upon the foundation of the apostles and prophets, Jesus Christ himself being the chief corner stone." A cornerstone is the very first stone that is set in place when you build a structure. It is the most important stone because all of the rest of the structure is built from it. Jesus Christ is the most important part of the church. (write JC - to represent Jesus Christ - in the bottom left space). When Jesus Christ was on the earth he called 12 Apostles to help build His church. Scripture #3 - Mark 3:14 // And he ordained twelve, that they should be with him, and that he might send them forth to preach. (Write numbers 1-12 in the spaces provided). Jesus Christ called other men to help build his church. Scripture #4 - Luke 10:1 // After these things the Lord appointed other seventy also, and sent them two and two before his face into every city and place, whither he himself would come. Jesus called a Quorum of 70 men to share the gospel and take care of the church members. Jesus Christ gave the Apostles and the Quorum of the 70 the Priesthood. They needed to be able to have the authority to Act in the Name of God as they preached His gospel and cared for the Saints. Scripture #5a - Matthew 10:1 - And when he had called unto him his twelve disciples, he gave them power against unclean spirits, to cast them out, and to heal all manner of sickness and all manner of disease. Suppose I was driving down the street and I was going very fast. I sped right past an Ice Cream Truck. The Ice Cream Truck followed me and finally I pulled over to the side of the road. The Ice Cream Man tells me that he is arresting me for speeding. He hands me an ice cream order form and says I have to pay a ticket for speeding. The Ice Cream Man might think he is doing the right thing, but he does not have the authority to give me a ticket for speeding. Our city officials give Police Officers the authority to hand out traffic tickets and arrest people for breaking the law. Some other churches think they are doing the right thing, but God must give the Authority to act in his name. That's why our 5th Article of Faith says, "We believe that a man must be called of God, by prophecy, and by the laying on of hands by those who are in authority, to preach the Gospel and administer in the ordinances thereof." The Aaronic Priesthood (or Priesthood of Aaron) was passed down by righteous men to John the Baptist and then to Jesus Christ. The scriptures tell us that it is very important to receive the priesthood by the laying on of hands by someone who holds it. Scripture #5b - Hebrews 5:4 // And no man taketh this honour unto himself, but he that is called of God, as was Aaron. 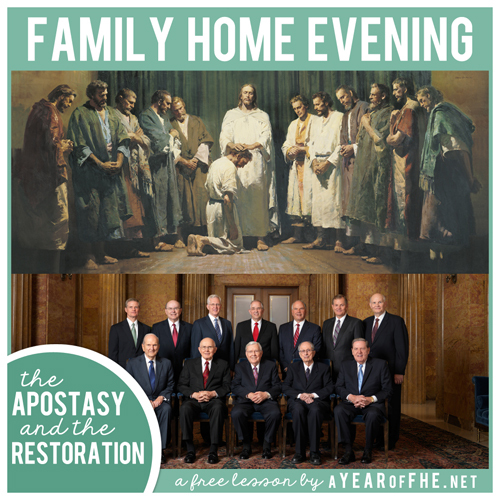 Having the Priesthood meant the Apostles and other Priesthood Leaders could receive revelation from God to know exactly what He wanted them to preach and teach His people within the church. Revelation is an important part of Jesus Christ's church. Scripture #6 - Amos 3:7 // Surely the Lord God will do nothing, but he revealeth his secret unto his servants the prophets. (Write REVELATION in the space provided). When righteous men, who hold the Priesthood, lead the church of Jesus Christ they know what Heavenly Father wants us to do. They know the will of God and the commandments He wants us to keep. Because of that revelation, the Church of Jesus Christ had 100% Truth. Scripture #7 - 1Timothy 3:15 // But if I tarry long, that thou mayest know how thou oughtest to behave thyself in the house of God, which is the church of the living God, the pillar and ground of the truth. So, this is the Church that Jesus Christ built when He was on the earth. It had many members and saints. Many believed His teachings and followed Him. As you relay the following you are going to cross out certain words on the chart as indicated below. - As we know, Jesus Christ was crucified (Cross out JC). - After His death, His Apostles led the Church. They taught the people everything that Jesus had taught. But many people did not like them, just as they did not like Jesus. The Apostles and other church leaders were killed because they believed and served Jesus Christ. (Cross out the numbered Apostles and Quorum of the 70). - Because the Priesthood Authority was lost, men could no longer receive direction on how to lead the church directly from Heavenly Father (cross out Revelation). 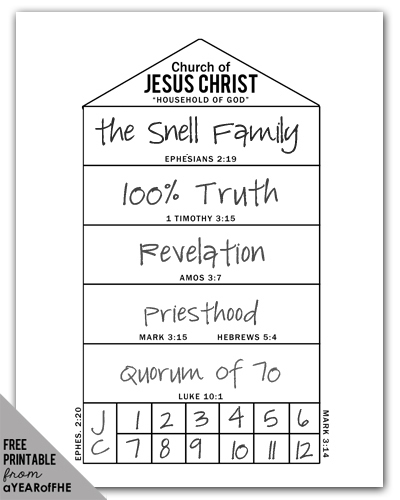 400 years after the death of the Savior, the Church as Jesus organized it was nowhere to be found in the whole world. This began the period known as the Great Apostasy. After man years, people started to believe in Jesus Christ again. They wanted to worship Him and follow his teachings. Some started churches in order to try and rebuild Christ's church again, but none of those new churches had what they needed to restore the Church of Jesus Christ again. In 1820, in America, many churches were preaching that they were the true church of Jesus on the earth. A young boy named Joseph Smith was attending their meetings, trying to figure out which one was really true. One day, Joseph Smith was reading in James in the New Testament. He read, “If any of you lack wisdom, let him ask of God...and it shall be given him” (James 1:5). Joseph wanted to know which church to join. He decided to do what the scripture said. Joseph went to a grove of trees one spring morning and knelt in prayer to ask of God. As he was praying, a bright light descended. In that light stood two glorious, heavenly beings: Heavenly Father and His Son, Jesus Christ. Joseph asked Them which church he should join. Jesus Christ told Joseph to join none of the churches. Joseph was commanded to rebuild the Church of Jesus Christ on the earth again. This is called the RESTORATION. We are blessed to have the restored Church on the earth. The Lord’s Church today is called The Church of Jesus Christ of Latter-day Saints. 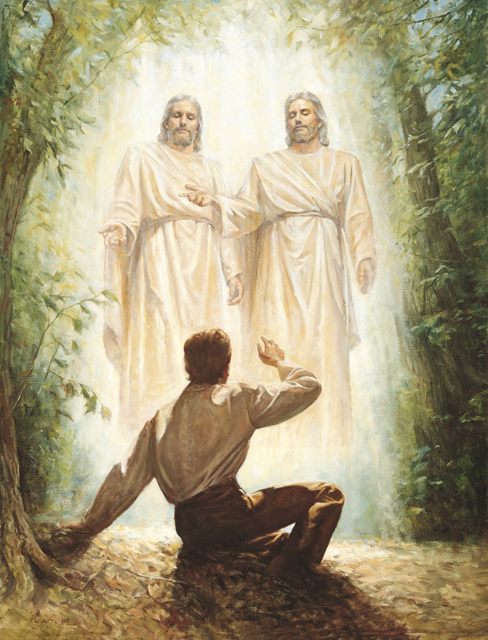 Latter-day is added to distinguish the church today from the one in ancient times. Bear your testimony about the restoration of the church. Share what revealed truths make a difference in your life (like Eternal Families, life after death, the Word of Wisdom, etc). This is phenomenal. THank you! !